McHugh Railroad Maintenance Equipment, Inc. – d/b/a McHugh Locomotive and Equipment. McHugh Railroad Maintenance Equipment, Inc. was incorporated in late November 1985 with the philosophy of being committed to build relationships with our customers on; trust, integrity, and to provide the correct solutions to their equipment challenges. It has always been the goal of McHugh Locomotive & Equipment to provide; expert service and high quality parts, at competitive pricing, for motive power and railroad equipment. The new McHugh Company under the leadership of JC McHugh has continued to grow expanding its product lines and services. Over the past 34 years we have delivered our high quality products and services, to class I railroads, short lines, regional rail, industries that operate in-plant rail operations, and heritage tourist lines, that are very satisfied with the McHugh Company. Our staff is made up of a diverse, qualified, and dedicated team, that works in a professional safe manner, continually meeting and exceeding our customers expectations. 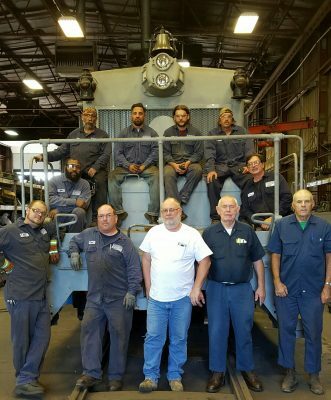 The McHugh Locomotive & Equipment team takes great pride in our business as being a source that you can depend on. The innovative thinking of the team members here at “Can Do McHugh” continue to provide successful solutions of equipment and operational challenges to the industries that we serve. McHugh Locomotive & Equipment over the years has continued to provide many specialized services for our customers. We have become know in the industry as a company that you can depend on to provide successful solutions for those unique equipment demands and operational challenges, along with taking care of those “one of a kind” projects. 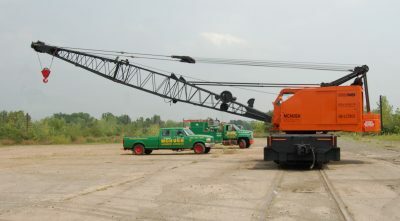 During the late 1980’s when several industries that were using cable operated lattice boom type locomotive cranes began to search for a supplier that could offer to upgrade their equipment and meet their new operational requirements. McHugh Locomotive & Equipment met this challenge and partnered with a equipment manufacture to develop a new machine to meet the industries demands. Our staff work with the engineering department at Barko Hydraulic’s LLC and together we jointly developed a specialized hydraulic knuckle boom material handler that operated on railroad track. 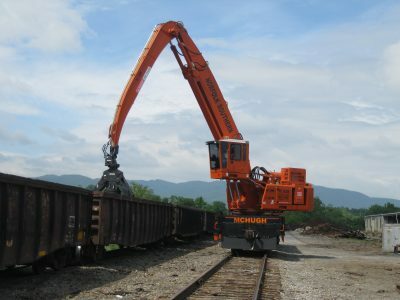 The McHugh / Barko machines were introduced in 1989 and have been successfully operating at industries with rail operations such as steel mills and scrap recycling yards. 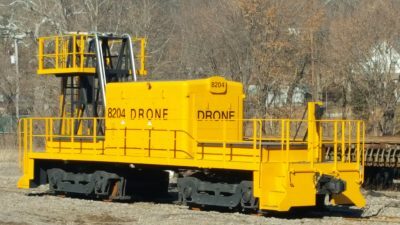 A class I railroad in 2012 approached McHugh Locomotive & Equipment and asked us if we could develop a new hydraulic knuckle boom material handling machine with a self-elevating operators cab that was specifically designed so that the unit could be operated over its entire rail system. The first new proto-type McHugh / Barko model 695 epic railroad material handling machine was introduced and delivered in May 2013. 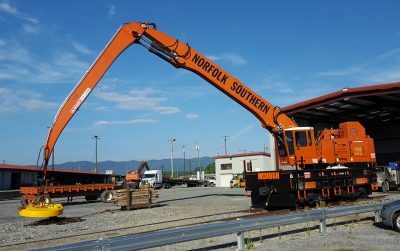 Due to the great success of the new McHugh / Barko model 695 epic railroad machine at this class I railroad, that company ordered a second machine and that unit was delivered in July 2015. A global steel manufacturing company in January 2016 contracted McHugh Locomotive & Equipment to develop a new remote controlled trolley electric locomotive for one of its plants located in the United States. The new locomotive was built during 2017 and 2018 by the McHugh Company and we delivered our first DRONE locomotive to the steel manufacturing plant in January 2018. A second DRONE locomotive is currently being produced at our facility and it is scheduled to be delivered during mid 2019. Hands on Experience and knowledge of the industries that we serve. JC McHugh, CEO & president of M.R.M.E., INC. had the unique opportunity of growing up in a family who operated a business that covered so many different industries. This enabled him to learn the intricacies of those industries at a very young age. Please view our history page to learn about the McHugh family former businesses of: Crane, Rigging, Heavy Haul, & Railroad. Railroad Industry: JC in 1979 became qualified to work on and lead a team of machinist, and other craftsmen to rebuild locomotives, rail cranes, and other railroad related equipment. Their extensive overhauls included the upgrading of the units to the safety standards, set forth by OSHA, the United States Department of the Federal Railroad Administration and Association of American Railroads. JC has also operated many various types of locomotives and other railroad related equipment. This has been at the McHugh facilities or at class I & regional railroads, short lines, transit systems, and industrial plant rail operations. Heavy Hauling / Rigging / Crane Industry: JC also since 1979 has work as a heavy haul truck driver and operating engineer. He has driven specialized heavy haul tractor trailers with loads weighing up to 250 ton and operated cranes with a 225 ton lift capacity. JC has been involved with many critical rigging and crane lifts. Some of those special multi crane lifts include the hoisting of derailed 450 ton railroad cars full hot molten steel at the former US Steel Fairless Works and to place them back onto the track. The McHugh’s have a long history of supporting various preservation operations that continue the heritage of America’s rail transportation industry. Jimmy McHugh in the mid 1960’s began assisting several heritage railroads and trolley museums, with donations of supplying: cranes, rigging, and hauling of historical rail equipment. JC McHugh since 1979 has continued the McHugh family tradition of providing donations to heritage railroads and rail transportation museums. These donations of materials and services have assisted in saving numerous vintage diesel locomotives from the scrapers torch.